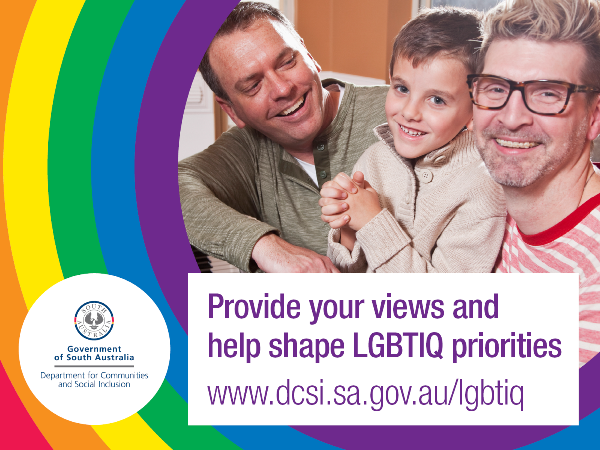 The State Government is seeking community feedback on a new paper that explores how it can continue to address the concerns and needs of lesbian, gay, bisexual, transgender, intersex and queer people. The Way Forward – the LGBTIQ Report is now available for feedback until 28 February 2018. The consultation is part of the Government’s commitment to evaluating its progress on LGBTIQ inclusion every two years. It will use the community feedback to inform its departments and agencies in shaping ongoing priorities. The Government released the 2014–2016 Strategy for the Inclusion of Lesbian, Gay, Bisexual, Transgender, Intersex and Queer People in May 2014. Its aim was to increase awareness and education in the broader community about their issues, and to support government departments to include a focus on LGBTIQ people when developing policies. The new paper seeks to encourage further discussion about what else South Australia might do to address the needs of the LGBTIQ community.